CITIZEN, public projection project, image generation transforms of residents’ portraits. ONOMAT series of ‘pirate radio’ broadcasts, relay to Resonance FM London on March 22. TOKYO RODEO, live image/sound transforms in four-channel sound space. Image transforms and live sound manipulations of location recordings and prepared piano. 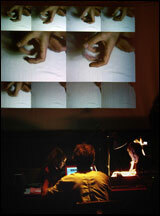 FISH FEET, live manipulation/rebroadcast of international audio streams. Composers in residence, New Adventures in Sound Art. Premiere of HEAD! SMASHED! IN! BUFFALO! JUMP! October 24.